Can 10Gb Switch Port Link to Gigabit Switch Port? With the tendency for higher speed network, 10Gb switch has already become familiar with home individuals, no longer the privilege of enterprise operators. However, the issue of SFP to SFP+ compatibility always puzzles many network switch users, even some engineers. Will 1Gb SFP transceivers work with 10Gb SFP+ ports on 10Gb switch? Or will 10Gb SFP+ run at 1Gb to link gigabit switch? And If 10Gb optics in a switch can auto-negotiate to 1Gb when the other end is 1Gb? All these related questions origin from the link between 10Gb SFP+ slots on 10Gb switch and 1Gb SFP ports on gigabit switch. Thus this article will reveal the mask of SFP to SFP+ compatibility from this point of view. Will 1Gb SFP transceivers/modules work with 10Gb SFP+ ports? The answer is “Yes” in most cases. There are many vendors providing 10Gb switches that can take both a 10G SFP+ and a 1G SFP in the 10Gb SFP+ slot, but not at the same time for obvious reasons. This option is supported by dual speed operation. So before plugging a SFP transceiver into the SFP+ port on your 10GbE switch, one must consult your rep to make sure the 10Gb switch port support dual speed. 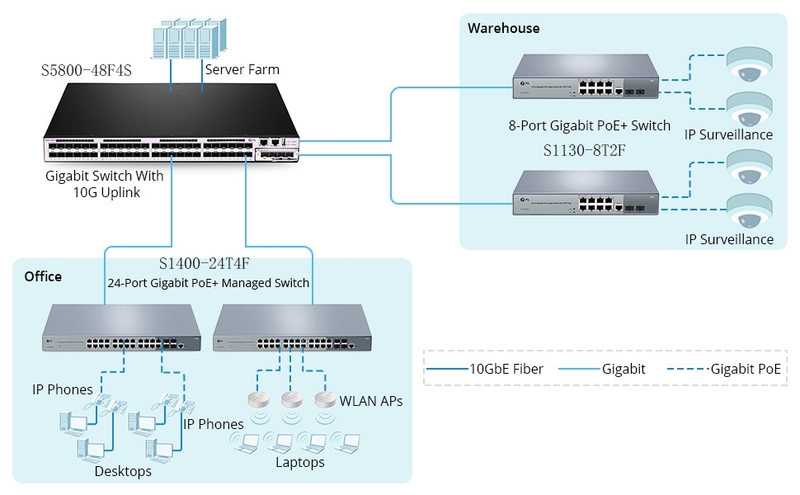 To achieve link of 10Gb switch port to gigabit switch port, here is a simple guide. Install a 1Gb SFP module on the 10GbE switch SFP+ port and the gigabit switch 1Gb SFP port respectively, then connect the 10Gb switch and the gigabit switch with corresponding 1Gb SFP fiber cable or Ethernet copper cable (eg. Cat6). Will 10Gb SFP+ running at 1Gb? The answer is definitely “No”. SFP optics do work in SFP+ slots in most cases, but SFP+ optics on 10Gb switch can never work in SFP slots on gigabit switch. The reason is about a power availability thing. As we know, once an module is installed, the speed of the port is decided. Most SFP+ slots are backward compatible with SFP modules to run at 1G speed. However, the SFP slots on gigabit switch cannot support the 10G speed required by SFP+ modules. For instance, most Cisco and FS 10Gb switches support 10G SFP+ and 1G SFP optics on their SFP+ ports. But some Brocade gear and HP A-series models are SFP+ only. One need to double check the compatibility of this switch with the vendor rep.
FS 10Gb switch SFP+ port links to gigabit switch SFP port via 1G SFP modules and fiber patch cable. Unlike copper SFP modules supporting 10/100/1000 auto-sensing, fiber optics do not support auto-negotiation. Because this technology is based on electrical pluses but not optical pluses. Thus 10Gb SFP+ optics on 10Gb switch can not auto-negotiate down to 1Gb if the other end is gigabit switch. In fact, most SFP and SFP+ transceivers only run at its rated speed and the transceivers at both end of the cable should at the same speed. For example, if a 10Gb SFP+ module is plugged into the 10Gb switch port, it will only run at 10Gb. In this case if you link it to the gigabit switch port, it will not work. When sticking a 1Gb SFP module in the 10G SFP+ port, the 10Gb switch will only run at 1Gb. As thus you can link it to gigabit switch. Sometimes the 10GbE switch port would lock the speed at 1G until you reconfigure the switch to 10G. It is noted that SFP+ port usually enables a speed under 1G, which means one cannot insert 100Base SFP modules into SFP+ ports on 10Gb switch. For the issue of SFP to SFP+ compatibility, a simple response is that most SFP+ can take SFP but not vice versa. The uncertain situation requires one to ask their switch vendors for clear reply. Thus 10Gb switch port is possible to link to gigabit switch port to run at 1G speed. The only thing you need to do is to plug each the aforesaid port with a 1Gb SFP module, and then connect the two modules on the 10Gb switch and the gigabit switch with a corresponding fiber patch cable or Ethernet copper cable. For a wide range of home lab and SMB users, 1/10G Ethernet switch saves budget and plays a big role in network expansion. In this regard we have recommended various gigabit switches with 10GbE uplink, say S3800-24T4S managed 24 port switch with 4 x 10G SFP+ uplinks. Actually, S3800-24T4S also highlights stackable capability. So today let’s dive into S3800-24T4S gigabit 24 port stackable switch. FS S3800-24T4S stackable 24 port switch is one of FS S3800 Series Ethernet switches. It is designed for class-carrier 1GE access and 10G uplink network, and dedicated to covering all kinds of enterprises and operator customers. 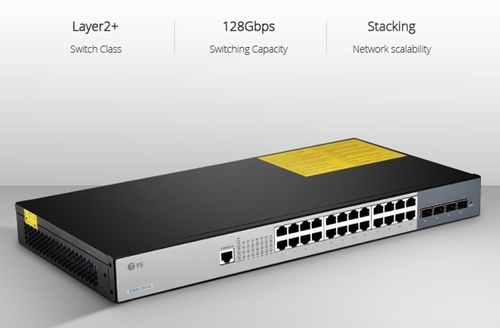 This gigabit switch comes with 1 x console port, 24 x gigabit ports and 4 x 10G uplinks. Profit from 4 x 10G SFP+ ports, S3800-24T4S 24 port gigabit switches can be stacked together to work as a whole unit for cost-effective 10GE access or aggregation. Besides, it adopts high performance processor to achieve full wired speed forwarding and line-dormant capacity to coordinate with NGGN unified software. Table below lists the detail specifications of S3800-24T4S 24 port switch. In addition to the above mentioned information, S3800-24T4S 24 port stackable switch also features other characteristics. S3800-24T4S gigabit 24 port switch provides high port density with 24 x 10/100/1000base-T RJ45 copper ports and 4 x 10G SFP+ uplinks in a compact 1RU form factor (17.32’’ x 8.66’’ x 1.73’’). The port diversity allows one to directly connect it to a sever, to a 10G switch with uplink port for 10GbE network, or to stack up to four S3800-24T4S gigabit switches together to expand network bandwidth. It is noted that FS S3800-24T4S 24 port switch comes with two power versions: single power supply and dual power supply. The S3800-24T4S 24 port gigabit switch with two built-in power supplies provides redundant power supply in unexpected outage. Generally speaking, for L2+ Ethernet switches, single power completely can satisfy the need, and it won’t easily go dead. However, the dual power supply does play backup role in power failure, thus it is ideal for mission-critical applications. FS S3800-24T4S 24 port stackable switch is equipped with 2 x build-in cooling fans and plenty reserved vents, which facilitate air flow and system cooling. Also, 28 x LED indicators are laid in order to report the working status and display the “slot number” for rapid identification and problem resolution. As fully managed gigabit Ethernet switch, S3800-24T4S 24 port switch can be managed by both CLI command and web user interface. Moreover, for excellent hardware and software, the gigabit switch is perfectly matching applications of small networks. For instance, it supports various advanced functions, including CPU, QoS, DHCP, VLAN/VxLAN, BCM53346 Chip and etc. How to Use S3800-24T4S 24 Port Stackable Switch? As a managed gigabit stackable switch, S3800-24T4S 24 port switch can be either used as standalone switch or a part of stacking system. This flexibility enables availability in various physical networks. For expanding network capacity and simplifying management, stacking switches is very popular in data centers. A single S3800-24T4S stackable 24 port switch can provide 128Gbps switching capacity to your network. However, it will double the capacity to 256Gbps as 2 switches are stacked as a whole. In fact, S3800-24T4S gigabit Ethernet switch supports up to 4 switches stacked together, extending your network to a total switching capacity at 512Gbps. Also, operators can easily control all the stacked switches with the console port and add or remove a gigabit switch without affecting other switches in the stacking system. To stack up S3800-24T4S 24 port switches with 10G SFP+ ports, you should connect them via SFP+ modules with fiber patch cable or via DAC or AOC directly. Here is a video presentation for S3800 Series 24 port switch stacking. FS S3800-24T4S managed stackable 24 port gigabit switch with 4 x 10G SFP+ uplinks is an excellent solution to expand your network from 1G to 10G. Further more, with physical stacking technology, 4 S3800-24T4S 24 port stackable switches can be stacked as a whole system, which boosts your network to 512Gbps total capacity and simplifies management. 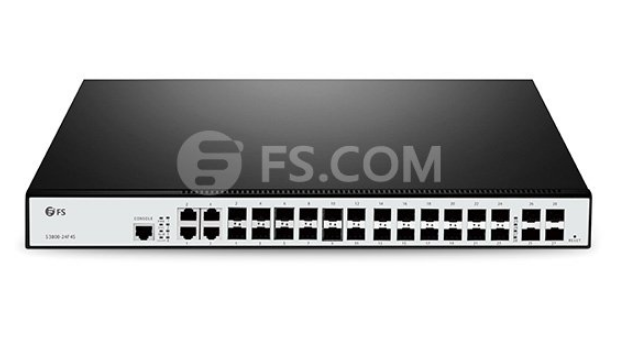 Besides S3800-24T4S gigabit Ethernet switch, FS S3800 Series also include S3800-48T4S 48 port gigabit switch and S3800-24F4S fiber SFP gigabit 24 port switch. 24-Port Switch Selection: Which Is the Suitable Choice? An Ethernet switch acts as a bridge to connect different parts of a network together. Although many routers also possess the network switching capabilities and multiple Ethernet ports, the Ethernet switch is not the replacement for routers. It is worth emphasizing that Ethernet switches are smarter than routers in that they operate at the data link layer (Layer 2) and the network layer (Layer 3) of the OSI Reference Model and therefore support any packet protocol. Ideally, switches will make better use of bandwidth if you prefer wired to wireless connections but have more devices than available Ethernet ports. On the other hand, an Ethernet switch is a costly way to expend the network in home or small business. So it is very important to invest an Ethernet switch with the appropriate number of ports to fit your needs. 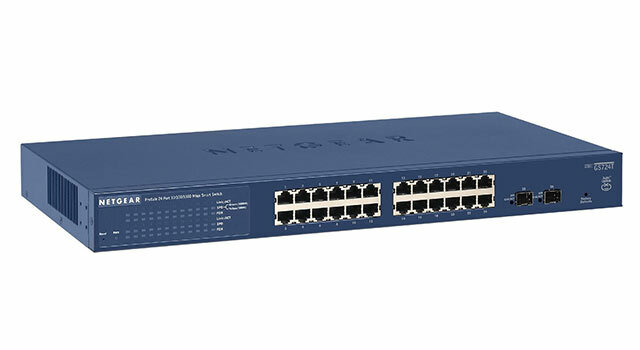 In the midst of various Gigabit Ethernet switches, a 24 port switch is considered as the most common Gigabit switch that connect devices in a local area network. Then this article will explore how to select a suitable 24-port switch. FS S3800-24F4S 24-port switch comes with 20x 100/1000BASE SFP, 4x 1GE combo and 4x 10GE SFP+ slots. The flexible port combination form provide a high bandwidth aggregation connectivity for multiple switch in network to enhance network capacity. Moreover, it is a stackable SFP managed switch, which can provide true stacking of up to 4 switches in a stack acting as a single unit with totally 106 ports (96x 1G Ports and 10x 10G ports). The switching capacity is 128Gbps. This 24-port Gigabit managed switch fits for enterprise network operators who need high performance and low power processor to provide full speed forwarding and line-dormant capacity. Cisco SGE2000P comes with 24 10/100/1000BASE-T RJ45 ports and 4 shared Gigabit SFP slots. This 24 port switch can provide ACL (access control lists), DoS (denial-of-service), VLAN and IEEE 802.1X port authentication. And the enhanced quality of service (QoS) and traffic-management features help ensure clear and reliable voice and video communications. This Gigabit network switch enable you to take advantage of the comprehensive feature set for a better-optimized, more secure network. The Netgear ProSafe GS724T is armed with 24 copper 10/100/1000 ports and 2 SFP 100/1000 ports. Each port can transfer data at maximum throughput for a total maximum switching speed of up to 48 Gbps. This 24-port switch is intended for SMB organizations using the switch for applications like VoIP, video conferencing, and system security, etc. And it features a fanless system, allowing the switch to work silently without overheating. This is great for use on homelab, as its quiet operation won’t cause a distraction. The TP-Link TL-SG1024 features 24 Gigabit Ethernet ports and non-blocking switching, which can provide large file transferring and also be compatible with 10Mbps and 100Mbps Ethernet devices. Moreover, this network switch has 48Gbps switching capacity with 8K MAC address table, 10KB Jumbo Frame and 4MB buffer memory. This TP-Link switch is a fanless rack mount design with LED diagnostic lights, so you can easily tell which ports are in use. It can automatically adjust power consumption according to the link status to limit the carbon footprint of your network. The price is $69.99 on Amazon. So this fanless Ethernet switch is good for your wallet both because it is inexpensive to buy and because of its energy-saving technology. 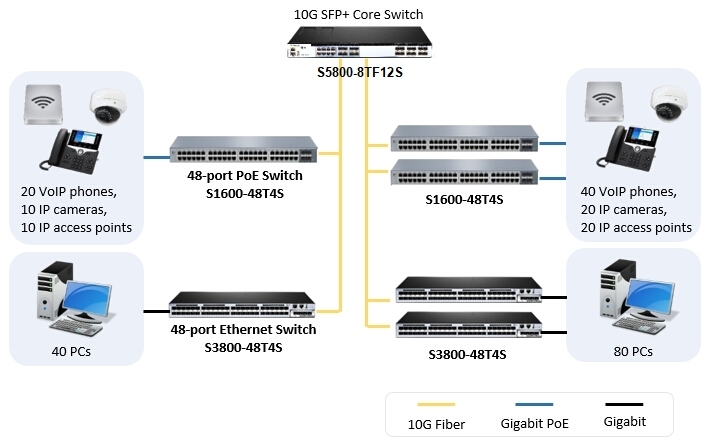 From the chart we can see, all the Gigabit switches listed above provide 24 port Ethernet RJ45 ports, only FS S3800-24F4S 24 port switch has 4 SFP+ uplink ports. They have some characteristics in common that make them suitable for being used in places like home or small business office. In terms of the power consumption, TP-Link TL-SG1024 and NETGEAR ProSafe GS724T are lower than others, but the huge price spread exists between these two switches because NETGEAR ProSafe GS724T has another two SFP ports for more flexible application. Among these four switches, if you have no limited cost budget, FS S3800-24F4S is a good choice. It has more flexible port combination and higher switching capacity, that is why it may cost a little more than the other three switches. If you need stronger data transferring capability, FS S3800-24F4S is a better choice considering its forwarding rate. On the contrary, TP-Link TL-SG1024 is the best budget choice. If you want a fanless switch, NETGEAR ProSafe GS724T is an inexpensive and reliable choice, but the install program only works on Windows and the secure management is very difficult to be enabled. When choosing a Gigabit Ethernet switch, the first factor to consider is how many devices need to be networked together. Purchasing a network switch with too few ports and not enough capacity will prove ineffective, and one that is too large can be a waste of money. Generally, small offices with a few employees should start with a 16-port switch, but a business that is looking to expand its operations soon needs a 24-port switch. So 24-port switch is the most future-proofing and cost-effective choice in small business network. Except the above mentioned S3800-24F4S, FS.COM also provides other three cost-effective 24 port switch for different demands.